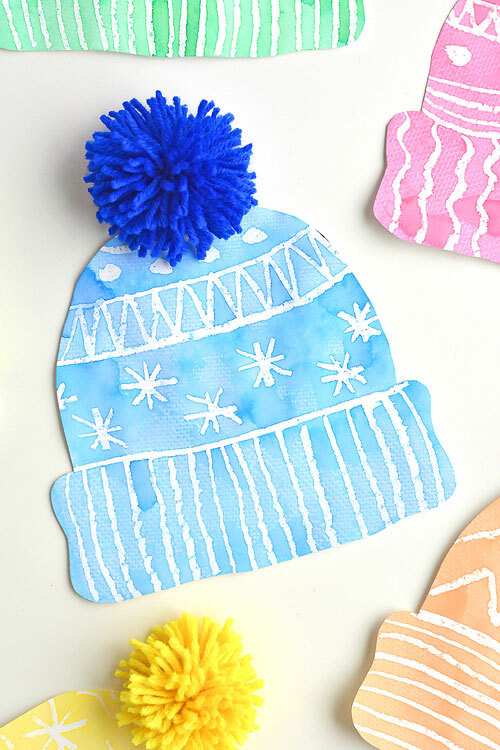 This winter hat art project for kids is so much fun! We were experimenting with all sorts of “magic” here. 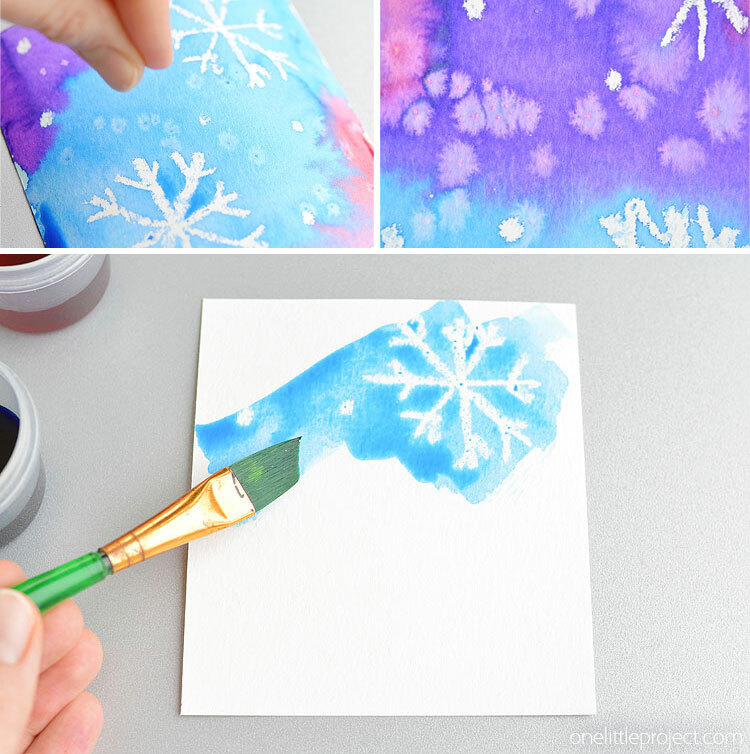 Ever since we made the magic salt and watercolour snowflake paintings the other week, we’ve been having lots of fun hiding secret patterns on our paper and having them magically appear when we paint over them with watercolour. And our new added skill of the day? Adding texture to the watercolour paint! If you look closely at the pictures below, you can see that we managed to create a “woven” texture on the hats, which looks super cool! 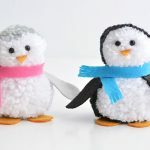 So along with making our own pom poms (My 8 year old is LOVING making pom poms lately…), we explored all sorts of arty and crafty skills in this project! 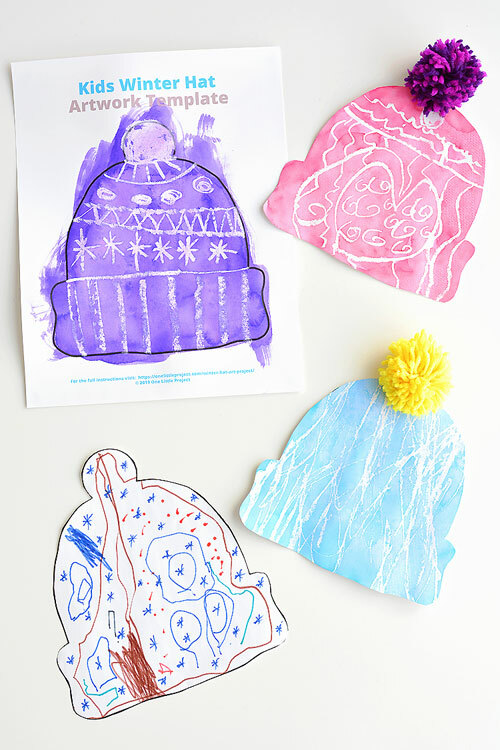 My 4 year old was soooo excited to try this winter hat art project! And I feel so bad, because last night was one of those nights that was GO GO GO. So by the time I finished being a chauffeur, making dinner, and helping all 3 kids with their homework, I was too exhausted to fully make this project with my little guy. But I printed out the free printable (see below), and helped him draw patterns all over it with marker before we cut out the shape – And he was so proud of himself! He got out of bed this morning and the first thing he did was wander into the kitchen to admire his little paper hat. He generally doesn’t love crafts like my girls do, but he is always super excited to try out the projects I post here on One Little Project! 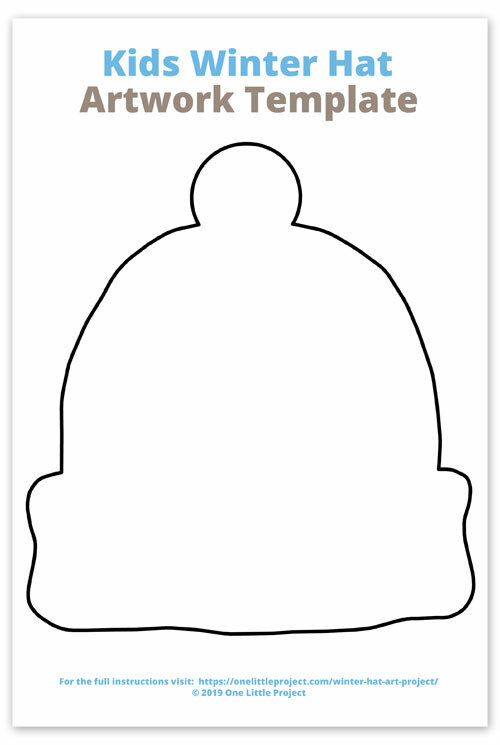 Grab your free printable Kids Winter Hat Artwork Template here, or you can click on the image below to get the PDF. I recommend printing the template on heavier cardstock paper. We tried painting on regular printer paper and the paint soaked right through and made a bit of a mess on the table. The paper was fine once it dried, but keep in mind that it does soak through. We used 65lb white card stock (the exact link to the type I used is in the list above). I had to iron the paper after I printed the templates because my printer made it curl a bit. But other than that it worked really well! The paint didn’t soak through the card stock, and there wasn’t a lot of warping after the paper got wet with paint. Start by drawing a creative pattern onto your hat. 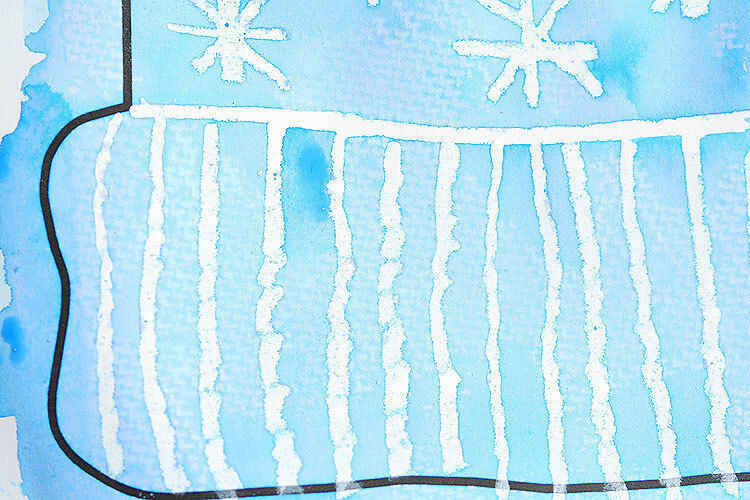 Snowflakes, swirls, lines, dots, squigglies, zig zags – you can decorate it however you like! 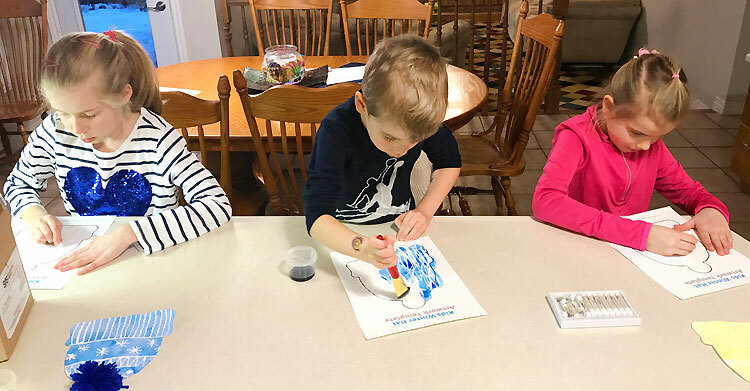 We used oil pastels because it’s easier to see them on the white paper, but you can definitely use white crayon instead. Either will work well. You could even use coloured crayons if you wanted to have even more colour and texture. 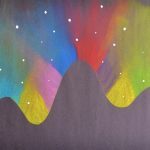 I bought a pack of 12 white oil pastels (the link to the exact ones I used is in the materials list above) when I made the Northern Lights Art Project last week, so I had lots to work with! And I’m LOVING how our projects have looked when you paint over the white oil pastel with watercolour! The secret, hidden pattern magically appears! I used liquid watercolour paint (I linked to the exact brand that I used in the list above). Any watercolour paint should work, but I like the liquid paint because you do end up needing quite a bit of paint for this project to cover the entire hat. I followed the directions on the liquid watercolour bottles and made a tiny batch of 1/2 teaspoon watercolour + 2 teaspoons water in a little dollar store salad dressing container for each hat. And each hat used about half of the small amount of paint that I made. The bottles are pretty big, so this paint is going to last a LONG time! 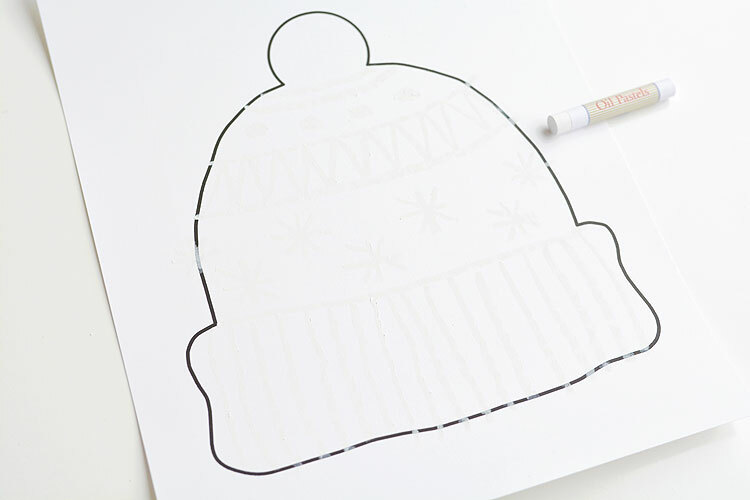 Cover the entire hat with watercolor paint. Make sure you paint over the outline of the hat. You want the entire thing to be covered in paint after you cut out the hat shape. Then cover the hat with a piece of paper towel. Feel free to blot it down (without shifting it) with the back of the paint brush. By adding the paper towel, I was able to absorb some of that extra watercolour paint so the paper didn’t warp. 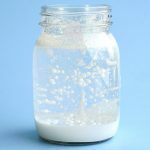 Plus it gives it an amazing texture! 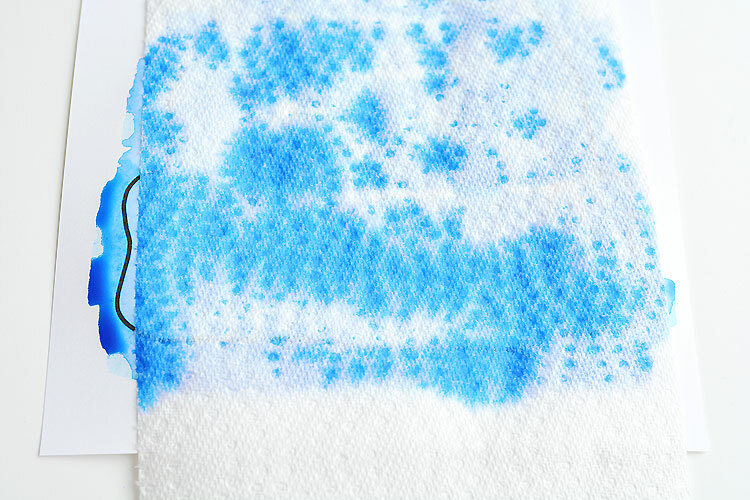 Leave the paper towel on top of the painting for about 1 minute without moving it. When you take it off it leaves you with an amazing woven texture in the paint! I LOVE how it adds extra texture to the hats and makes them look like they are actually knitted! Once the paint is dry – and it took about an hour for the paint on ours to dry – you can use scissors to cut out the hat shape. Check out the AWESOME texture from the paper towel in the photo below! 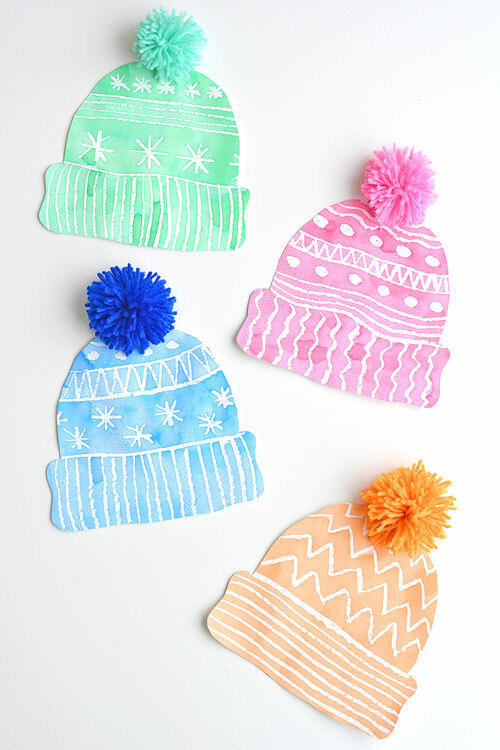 If you’re nervous about making your own pom poms from yarn, you can use store-bought, craft pom poms, or even cotton balls to finish off the hat. If they’re too small, add a bunch of them to fill in the pom pom circle on the hat. 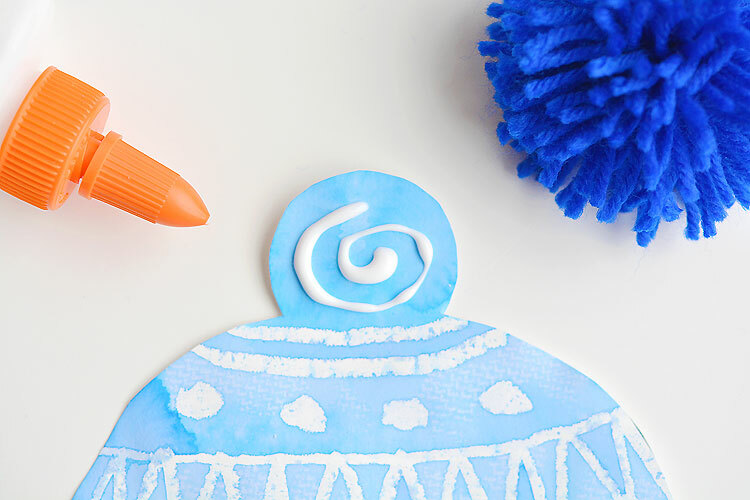 It’s super easy to make your own pom poms! There’s all sorts of tools you can use, but I find it’s the easiest to just use your hands. 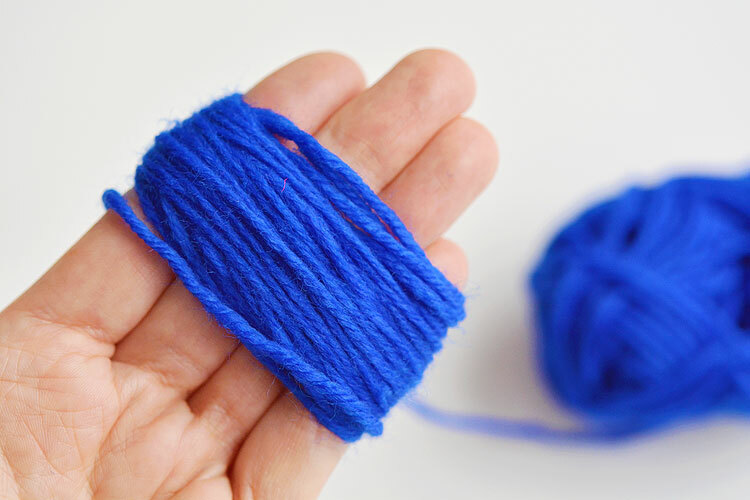 Wrap the yarn around your fingers about 60 times. Cut the yarn when you’re done, leaving yourself a few inches at the end. 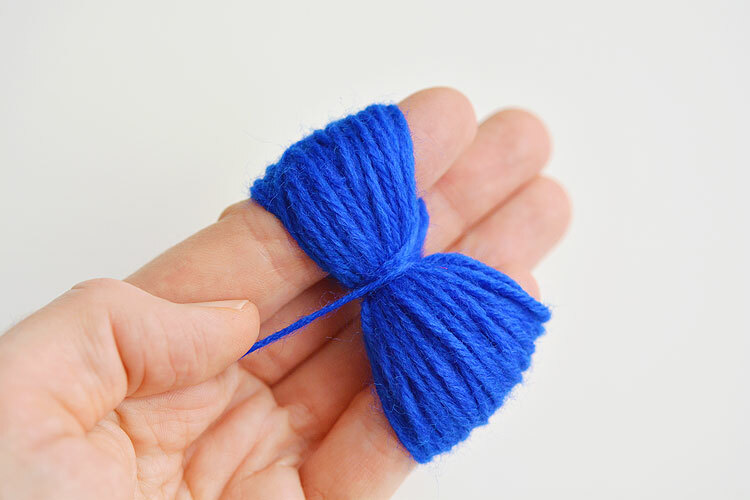 Remove your middle two fingers, and tightly wind the end of the yarn around the middle of the bunch a few times. You don’t need to tie it yet, but winding it will help to keep it together when you take it off your fingers. Carefully remove the yarn from your fingers. Place it over top of a 6 inch long piece of yarn. 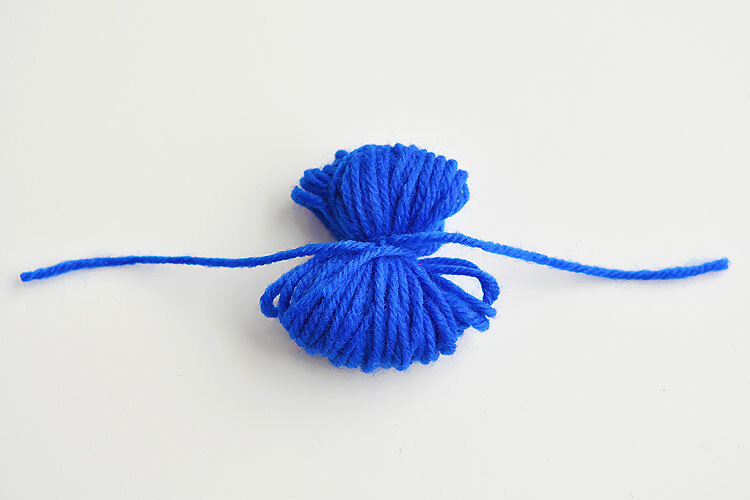 Tie the yarn around the middle of the bunch as tight as you can. Then tie it in a double knot to hold it in place. Trim the extra long pieces of yarn that are leftover. 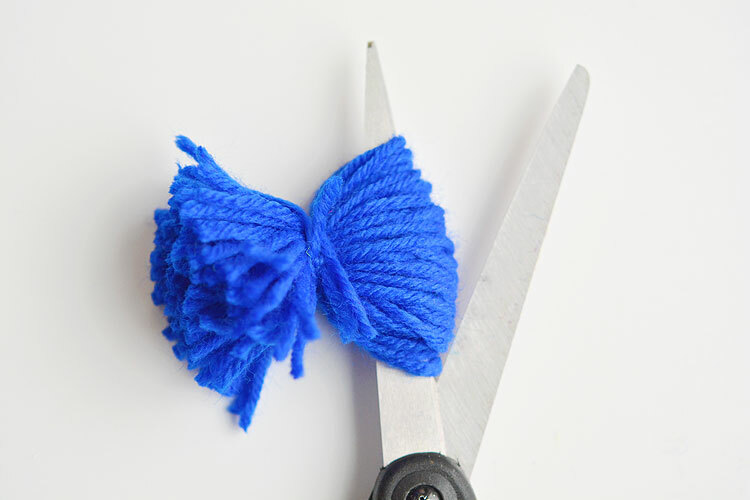 Using a sharp pair of scissors, slide the scissors through the loops and cut them. The scissors really do need to be sharp or else they won’t go through the yarn – I used my fabric scissors. 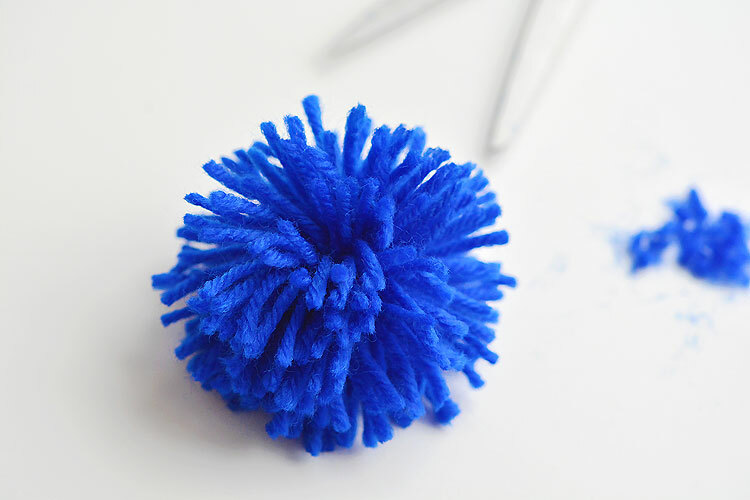 Fluff up your pom pom and give it a bit of a hair cut to make it ball shaped. Add some white glue to the ball on top of the paper hat. Then carefully press the pom pom onto the glue. Allow it to dry. 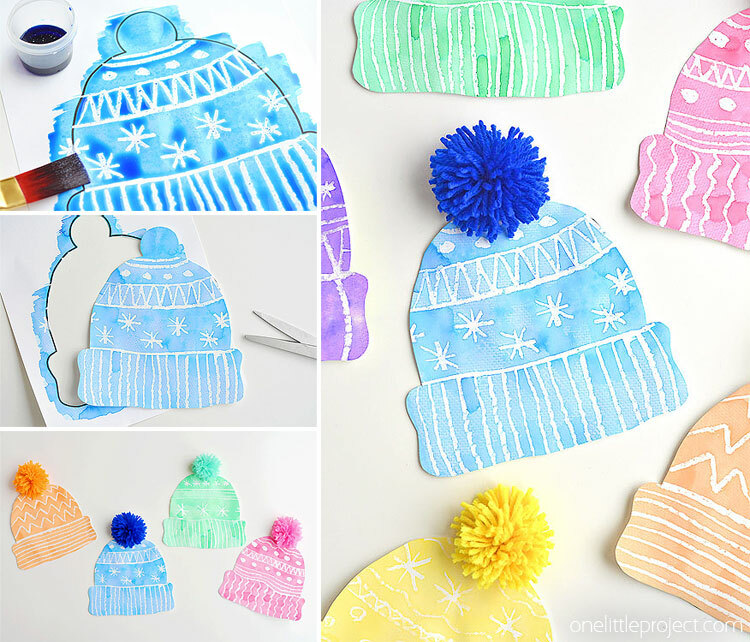 These winter hats are so easy to make and they’re so much fun! We made them in all 6 colours of our watercolour paint. And then we made pom poms to match each hat colour. I set my kids up at the kitchen counter tonight to work on this winter hat art project. My little guy (4 years old) was quick to get his done! He was already painting while the girls (8 and 6 years old) were still carefully drawing out their designs. They all did great though! It was so fun to see the different patterns and colour combinations they came up with. Even my 4 year old’s scribbles ended up looking really cool on the painted hat! Just to give you an idea of the different age and skill levels, below is a photo of all my kids winter hat art projects. The purple one is my 8 year old’s – she decided she would rather watch TV last night rather than finish hers, so we haven’t had a chance to finish it off yet. Don’t feel like you have to make solid coloured hats. You can paint them all sorts of colours! Or you could even use multi-coloured crayons to draw the pattern inside the hats. My kids went with single coloured hats, and dressed things up with different coloured pom poms. They’re so simple to make, and the kids had so much fun. They were so proud of their work! 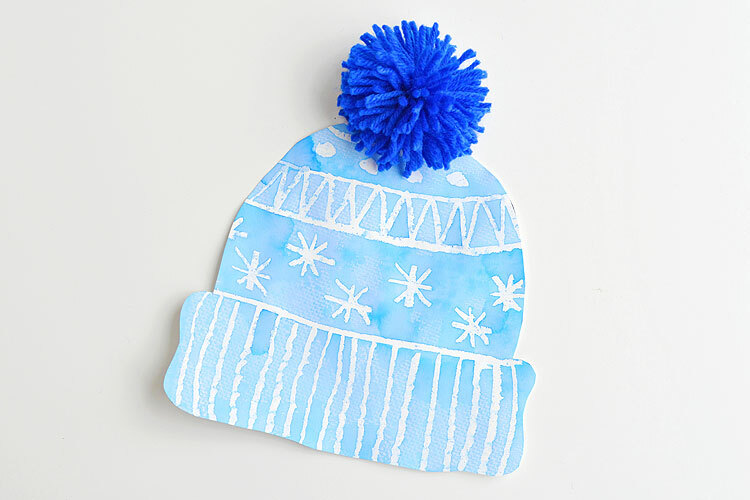 This winter hat art project for kids is such a fun winter craft idea! 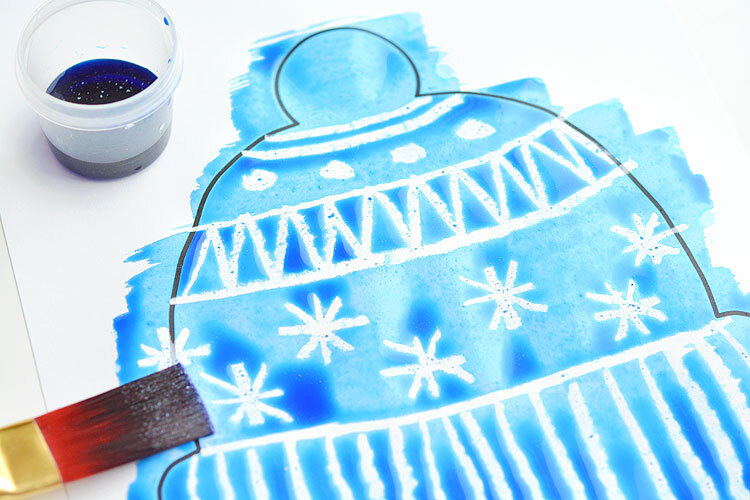 Use the free printable winter hat template to have a fun day of crafting at home or in the classroom! This process art idea lets you experiment with creating texture in watercolor. And it shows the magic of painting over crayon with watercolour paint! 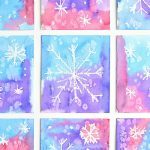 If you’re looking for more fun winter art project ideas, check out our tutorial for making magic salt and watercolour snowflake art. 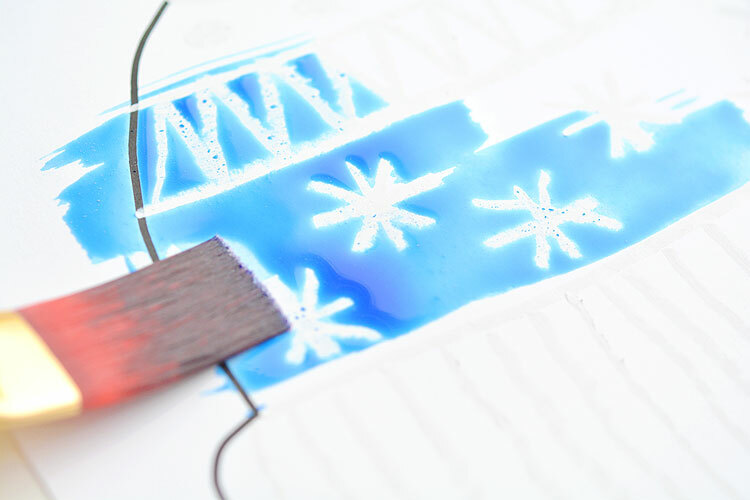 Did you know that when you add salt to watercolour it makes the painting look “frosty”!? It’s so cool! 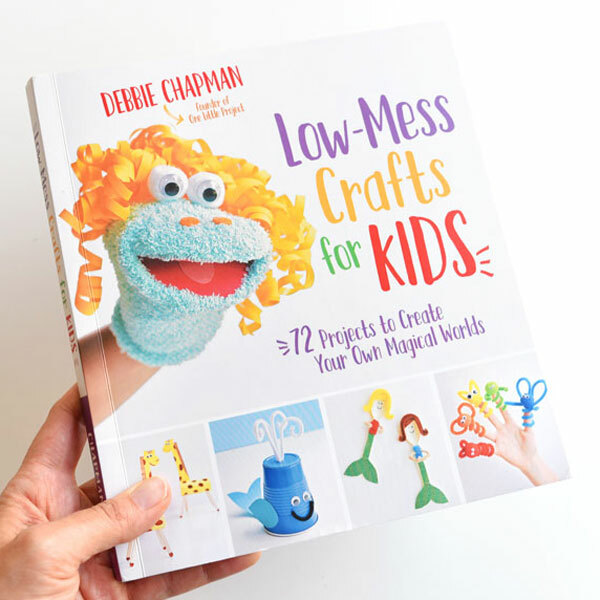 For more fun craft ideas, check out our new book Low-Mess Crafts for Kids for 72 fun and simple craft ideas for kids! The projects are fun, easy and most importantly low-mess, so the clean up is simple!